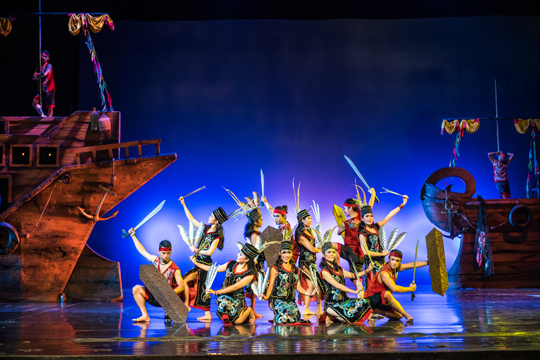 Devdan Show, Treasure of the Archipelago, is a masterpiece theatrical performance that treats viewers to both a classic and modern presentation based on Indonesia’s exotic cultures. For tourists and residents alike, who would like to learn more about Indonesia’s famed archipelago, Devdan Show promises to impress viewers of all ages and backgrounds with an unforgettable sequence of performances that hightlight the uniqueness of Balinese culture, the fiery spiritual and colourful Sumatran culture, the mystical and elegant Javanese culture, Borneo’s romantic and magical culture, and Papua’s stunning nature. Situated within the beautiful Bali Nusa Dua Theatre, your heart will beat with excitement as you encounter an impressive show with brilliantly crafted hi-tech special effects, superb illusions and death-defying aerial acrobatics. Explore the authentic heritage and beauty of Indonesia through a magnificent arrangement of contemporary songs and dances, accented by thrilling action. This mega production is a must-see show, a truly once-in-a-lifetime experience.